Every Tuesday, we will publish a piece of advice, for all of those who had recently engaged. Reading our tips you will surely manage to organize your wedding! Just follow Beautifulday Tuesday Say! Food and drinks are among the most important parts of the reception. But how to plan a bar facilities that satisfies wedding guests and do not spend half more than your budget? Choose from different serving models and calculate wedding bar costs. However, remember to adjust general guidelines to the local traditions and guests habits, that differ a lot among nationalities. If you decide to have a liquor-free party for religious or personal reasons – that is ok! You are the one who know your guests well. Although, if you ar sure your friends drink and you do not have fiery objections, better let on light in alcohol punch or let them know about you decision in advance. Be ready for questions about coming with their own stuff. Cash bar rules are easy. 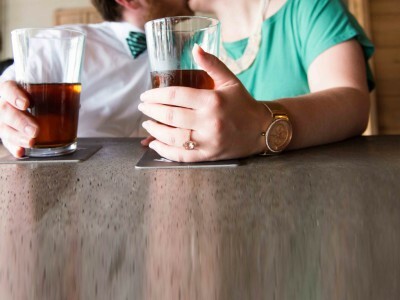 Your guests overlap bar costs immediately after ordering. Additionally, you may be responsible for the cost of the bartender, depending on a venue rules. That may be a good option only if you know you will not drink much and majority of your guests either. Otherwise, please do not do that! The idea to reduce the cost of the reception or to force guests to drink less is inappropriate. Better think about uncles dancing with coins in their pockets and friends walking back and forth to their rooms to hide a credit card before losing it. But if you absolutely insist on saving money in that way, think about pre-paying a bar with certain amount of money. Once you have reached your budget, the bartender will let you know and you will decide to pay more or to stay with cash bar. With a really tight budget better find a venue where you can serve pre-purchased alcohol and prepare self-service bar. Think about serving an exotic fruit punch or pre-purchased craft beers. The fact that the choice of alcohol is smaller align with an extra ice-tea and coffee bar. That will be less expensive than full service but still interesting for your guests. This new trend is not only enchanting, but also money saving! You simply have to made up Bride’s and Groom’s wedding drinks, decide how to mix liquids and give them names. Write them on a board and place it next to the wedding bar. They will highlight your wedding. 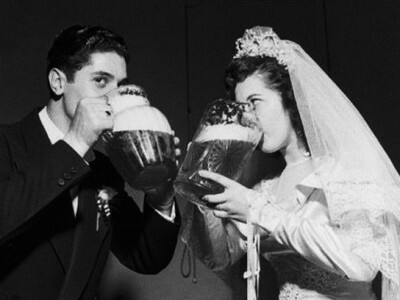 This may be a best option, if you have to use the venue’s or caterer’s alcohol. Judging by the number of guests, your bartender should mix them in advance. That means, he does not have to open new bottles. Once the alcohol is gone, the bar can serve non-alcoholic beverages. Ask one of guests, most often a groomsman, to be a designed “watcher”. He should keep an eye out for any guests who are getting overly drunk during the reception. Remember it is not only not to let them drink alcohol, but also to keep them fed and hydrated. Be sure there are soft drinks, water available. Decide to serve snacks like cheeses and meats. They stay in the stomach longer then carbs and absorb more alcohol. The beauty of such wedding bar is that guests can have as much as they want of whatever they want, including tea, soft drinks and water. If you can go for an open bar, your guests will appreciate it. Still the best way is to buy the alcohol yourself. Any alcohol you will not use you get to keep. A passionate for creating, who loves to surround with beautiful objects. Pays great attention to details, colours and textures. Admits that unique scenery is a key to success. A Bar Cart Art. Amazing alternative for a drink bar. Is a beer at the wedding a good idea? URSA MAIOR interview.